If you have found a wild animal in distress, it needs help as soon as possible. 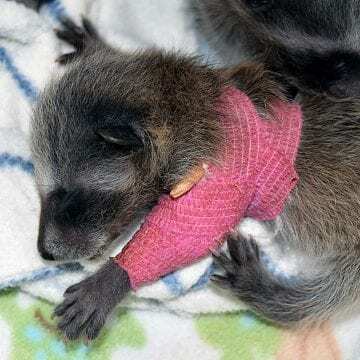 Like our pets, wild animals need professional care to recover if they are sick or injured. Locate your nearest wildlife rehabilitation centre in British Columbia or internationally, or contact the BC SPCA Provincial Call Centre at 1-855-622-7722 for advice. Many baby birds and mammals are mistakenly taken from their families each year by well-meaning rescuers. It’s important to make sure that a baby animal is truly orphaned before intervening – often their parent is hiding just out of sight, ready to return to the baby as soon as the human danger is gone. Unless there are clear signs of injury or sickness (like those listed above), it is best to call your local wildlife rehabilitator or the BC SPCA Call Centre at 1-855-622-7722 before acting. Interested in learning more? Find out what to do if you have found a baby bird (PDF), found a baby deer (PDF) or found a baby seal (PDF). This is a normal resting position for a healthy deer fawn. Items to keep close at hand for rescuing wildlife. Remember not to pet or cuddle the animal, as this is very frightening for wildlife. They don’t understand that you are trying to help them, and they will feel better if they are left alone in a quiet area. Do not give the animal anything to eat or drink – this can cause serious complications and even death for animals that are already in a stressful situation. Adult animals that are closing their eyes or panting are displaying signs of serious stress. Such animals should be taken immediately to a wildlife rehabilitation centre. Call the BC SPCA Provincial Call Centre at 1-855-622-7722 for emergency wildlife help – they can put you in touch with your closest wildlife rehabilitation centre, and let you know the best next steps to help with your wildlife situation. Baby bird that is too young to be on its own.